With over 4 decades on the market, mobile phones have become the most used electronic device in the world. Below is a list of best-selling mobile phones, released between 1992 and 2017. 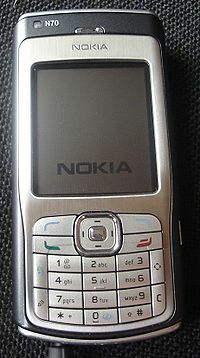 The best-selling mobile devices are the Nokia 1100 and 1110, two bar phones released in 2003 and 2005, respectively. Both have sold over 250 million units. The best-selling touchscreen phones are the Apple iPhone 6 and 6 Plus, both released in 2014. Together, they have sold over 220 million units. The best-selling flip phone is the Motorola RAZR V3, released in 2004. It sold over 130 million units. 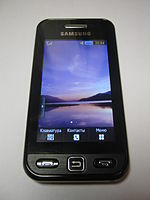 The best-selling slider phone is the Samsung E250, released in 2006. It has sold over 30 million units. Of the 40 phones on the list, Nokia sold the most models, with 15. In 2017, over 1.5 billion mobile phones were sold, with Samsung dominating yearly sales at over 321.2 million units sold, taking up 20.9% market share. Note: The years represent when the phones were released into the market, not the number sold in that particular year. The number sold represents how many units were sold throughout its whole lifetime. The first cell phone was produced by Motorola. Since then there have been produced around 17.37 billion mobile phones. Note that previous years have listed sales of mobile phones including non smartphones (so called feature phones) while from 2015 and on the statistics only show smartphone sales. 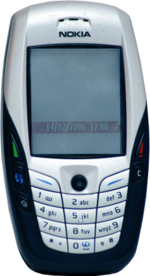 ^ a b c d e "Top 10 Best Selling Nokia Phones". Techpinas. Archived from the original on December 22, 2015. Retrieved December 21, 2015. ^ Tsirulnik, Giselle. "Mobile phone ranked most used electronic device: Forrester". Mobile Marketer. Retrieved August 5, 2018. ^ a b c d e f g h i j k l m n o p q r s t "The 20 bestselling mobile phones of all time". The Telegraph. August 6, 2017. Archived from the original on July 15, 2017. Retrieved August 12, 2017. ^ a b c d e f g h i j "20 of the world's top selling phones". ZDNet. December 9, 2013. Archived from the original on December 23, 2016. Retrieved August 12, 2017. ^ a b c d e f g Edmonds, Rich (April 4, 2013). "40 years have passed for mobile phones and Nokia dominates bestsellers list". Windows Central. Retrieved August 12, 2017. ^ "Samsung Galaxy S7 sales hit 55 million". gsmarena. Archived from the original on May 3, 2017. Retrieved May 11, 2017. ^ Evans, Jonny. "Apple's iPhone 7 is best-selling, and iPhone 6S most used, analysts claim". Computer World. Archived from the original on June 28, 2017. Retrieved August 12, 2017. ^ "Samsung GALAXY Note II sells 30 million units". October 2, 2013. Archived from the original on November 5, 2015. Retrieved August 12, 2017. ^ "Samsung Galaxy S Range Sells Over 100 Million Units". Retrieved August 12, 2017. ^ Bennett, Brian. "Samsung Galaxy S8 Shipped Over 20 Million Units Since Launch: Report". Retrieved August 3, 2017. ^ a b Oct 18, 2010 (October 18, 2010). "Apple Q4 2010: Record Quarter/Year, Surprises to Come — Apple News, Tips and Reviews". Gigaom.com. Archived from the original on July 14, 2014. Retrieved August 8, 2012. ^ Jan 14, 2013 (January 14, 2013). "Samsung Galaxy S sales to 100 million". bgr.com. Archived from the original on January 16, 2013. Retrieved January 14, 2013. ^ "Xiaomi Mi2 sold 10 million units in 11 months". Tech in Asia. Archived from the original on November 12, 2014. ^ Moon, Mariella. "Samsung sold over 40 million Galaxy S 4s in six months". Engadget. AOL. Archived from the original on October 26, 2013. 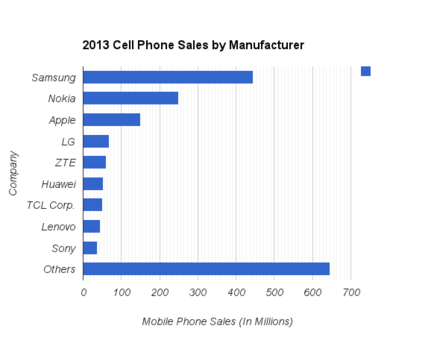 ^ a b c "Gartner Says Annual Smartphone Sales Surpassed Sales of Feature Phones for the First Time in 2013". Gartner. February 2014. Archived from the original on February 14, 2014. Retrieved February 13, 2014. ^ Silver, Curtis. "Apple Takes A Hit On iPhone 7 Sales, iPhone 8 May Be Worth Waiting For". forbes.com. Retrieved September 16, 2017. ^ "Analysts estimate Samsung Galaxy S8 sales about 20% lower than the S7". 9to5google.com. July 11, 2017. Retrieved September 16, 2017. ^ "Best-Selling Mobile Phones Worldwide All Time". StatsMonkey.com. February 8, 1999. Archived from the original on January 24, 2016. Retrieved September 6, 2015. ^ "Nokia Annual Report 1998" (PDF). Archived (PDF) from the original on November 4, 2013. Retrieved November 8, 2012. ^ a b "GartnerGroup's Dataquest Says Nokia Became No. 1 Mobile Phone Vendor in 1998". Tech Insider. Business Insider. February 8, 1999. Archived from the original on January 24, 2016. Retrieved September 11, 2015. ^ "Nokia overtakes Motorola". CNN. February 8, 1999. Archived from the original on January 24, 2016. Retrieved September 11, 2015. ^ "GartnerGroup's Dataquest Says Mobile Phone Sales Increased 65 Percent in 1999". Tech Insider. Business Insider. February 8, 2000. Archived from the original on January 24, 2016. Retrieved September 11, 2015. ^ a b "Gartner Dataquest Says Worldwide Mobile Phone Sales in 2001 Declined for First Time in Industry's History". Tech Insider. Business Insider. March 11, 2000. Archived from the original on August 26, 2015. Retrieved September 11, 2015. ^ "Gartner Dataquest Says Fourth Quarter Sales Lead Mobile Phone Market to 6 Percent Growth in 2002". Business Wire. Archived from the original on August 14, 2016. Retrieved July 19, 2016. ^ "Worldwide Manufacturer Sales to End Users of Mobile Terminal Devices in 2003". Umtsworld.com. Archived from the original on October 27, 2012. Retrieved August 8, 2012. 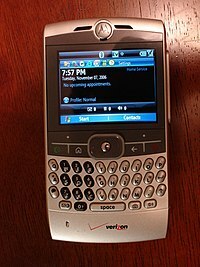 ^ "Gartner Says Strong Fourth Quarter Sales Led Worldwide Mobile Phone Sales to 30 Percent Growth in 2004". Gartner. Archived from the original on September 25, 2015. Retrieved September 11, 2015. ^ "Gartner Says Top Six Vendors Drive Worldwide Mobile Phone Sales to 21 Percent Growth in 2005. (Worldwide Mobile Terminal Sales to End-Users in 2005. Table: 2)". Gartner. Archived from the original on February 15, 2013. Retrieved August 8, 2012. ^ "Gartner Says Worldwide Mobile Phone Sales Grew 21 Percent in 2006. (Worldwide Mobile Terminal Sales to End-Users in 2006. Table: 2)". Gartner. Archived from the original on August 28, 2013. Retrieved August 8, 2012. ^ "Gartner Says Worldwide Mobile Phone Sales Increased 16 Per Cent in 2007. (Worldwide Mobile Terminal Sales to End-Users in 2007. Table: 1)". Gartner. Archived from the original on June 13, 2013. Retrieved August 8, 2012. ^ "Apple - Press Info - Apple Reports Fourth Quarter Results". apple.com. Archived from the original on January 1, 2012. ^ "Gartner Says Worldwide Mobile Phone Sales Grew 6 Per Cent in 2008, But Sales Declined 5 Per Cent in the Fourth Quarter. (Worldwide Mobile Terminal Sales to End-Users in 2008. Table: 2)". Gartner. Archived from the original on February 13, 2013. Retrieved March 2, 2009. ^ "Apple - Press Info - Apple Reports First Quarter Results". apple.com. Archived from the original on March 4, 2013. ^ "Gartner Says Worldwide Mobile Phone Sales to End Users Grew 8 Per Cent in Fourth Quarter 2009; Market Remained Flat in 2009. (Worldwide Mobile Terminal Sales to End Users in 2009. Table: 1)". Gartner. Archived from the original on September 23, 2012. Retrieved August 8, 2012. ^ "Apple - Press Info - Apple Reports First Quarter Results". apple.com. Archived from the original on January 1, 2012. ^ "Gartner Says Worldwide Mobile Device Sales to End Users Reached 1.6 Billion Units in 2010; Smartphone Sales Grew 72 Percent in 2010. (Worldwide Mobile Device Sales to End Users in 2010. Table: 1)". Gartner. Archived from the original on September 10, 2015. Retrieved September 16, 2015. ^ "Apple - Press Info - Apple Reports First Quarter Results". apple.com. Archived from the original on January 2, 2012. ^ "About The Industry – Electronics TakeBack Coalition". Electronicstakeback.com. Archived from the original on April 26, 2012. Retrieved August 8, 2012. ^ "Gartner Says Worldwide Smartphone Sales Soared in Fourth Quarter of 2011 With 47 Percent Growth. (Worldwide Mobile Device Sales to End Users by Vendor in 2011. Table: 2)". Gartner. Archived from the original on January 24, 2013. Retrieved August 8, 2012. ^ "Samsung Electronics Annual Report" (PDF). Samsung Electronics. Archived (PDF) from the original on February 6, 2013. Retrieved March 16, 2013. ^ "ZTE becomes world's fourth largest mobile phone vendor - GSMArena.com news". Gsmarena.com. Archived from the original on July 26, 2012. Retrieved August 8, 2012. ^ "Gartner Says Worldwide Mobile Phone Sales Declined 1.7 Percent in 2012. (Worldwide Mobile Phone Sales to End Users by Vendor in 2012. Table: 2)". Gartner. Archived from the original on December 28, 2015. Retrieved December 30, 2015. ^ "Gartner Says Smartphone Sales Surpassed One Billion Units in 2014. (Worldwide Mobile Phone Sales to End Users by Vendor in 2014. Table: 4)". Gartner. Archived from the original on July 21, 2015. Retrieved July 17, 2015. ^ "Gartner Says Worldwide Smartphone Sales Grew 9.7 Percent in Fourth Quarter of 2015 (see Table 2)". Gartner. Archived from the original on June 13, 2017. Retrieved July 2, 2017. ^ "Gartner Says Worldwide Sales of Smartphones Grew 7 Percent in the Fourth Quarter of 2016 (see Table 2)". Gartner. Archived from the original on February 18, 2017. Retrieved February 18, 2017. ^ "Gartner Says Worldwide Sales of Smartphones Recorded First Ever Decline During the Fourth Quarter of 2017 (see Table 2)". Gartner. Archived from the original on February 22, 2017. Retrieved February 22, 2018. ^ "Gartner Says Global Smartphone Sales Stalled in the Fourth Quarter of 2018 (see Table 2)". Gartner. Retrieved February 22, 2019.